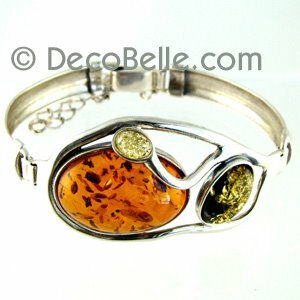 The Amber Deco Luxe collection is only high grade Baltic Amber, expect nothing less from Deco Belle. This collection was hand selected Baltic Amber from the Amber capital of the world in Gdansk, Poland, previously known as Danzig, Poland. This is our finest collection yet. 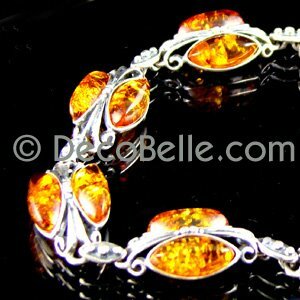 The genuine Baltic Amber at Deco Belle is unique, meaning that only one of each item exists in the world, unless they are sterling silver cast jewelry. 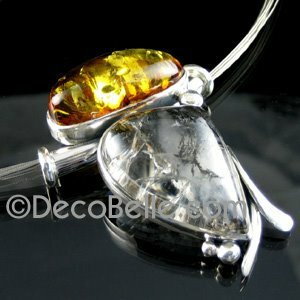 Cast jewelry means that Amber pieces of similar size and color are cut and shaped alike are inserted in a silver cast, usually in the form of links. An example would be our Windsor collection. Deco Belle believes this is an exquisite collection, and brought a few of each type of this back from Poland. The one-of-a kind jewelry is actually designed around the gem with respect to its size, shape, color, and inclusions. Included in this collection: Intaglio, Cameo, lockets, zebra Amber, Cognac, Honey, Lemon, Butterscotch Baltic Amber, and more!